I’d seen a lot of tweets about this book and I was instantly attracted to the Snow White style red apple on the cover, hinting at the evil lurking within. This was indeed a page-turner as each member of the gruesome club was being hunted – they could run but they couldn’t hide. It was quite grisly in places as details of the victims’ horrible deaths were described, but it gave just enough details to describe the scene and not give me nightmares. Abbey works in a museum and, in between the killings, we were treated to flashbacks of her life at university. Abbey had a traumatic experience and I didn’t know where the author was going with this – was Abbey the killer? Perhaps…perhaps not. The tying up of Abbey's story was brilliant, and I’ll certainly remember this book every time I visit a museum. I did really enjoy this book; I loved the way it was racing along and then suddenly everything slotted into place. I did get a bit confused with the identity of the detectives, Grey and Miles, as their nicknames and real names were being thrown around and I didn’t know who was who at first. This was more down to the speed at which I was reading rather than any confusion caused by Katerina Diamond. Each character had their own little story and I loved each and every one of them. 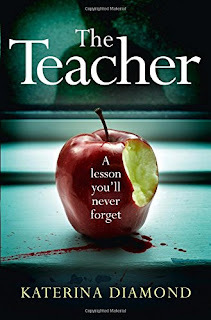 The Teacher is a fast-paced grisly page-turner and an extraordinary debut from Katerina Diamond.